Edited by: Jan Klimaszewski, et al. 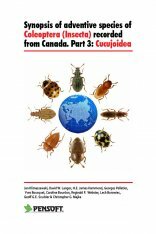 A synopsis of adventive species of Cucujoidea (Coleoptera) in Canada is presented. Of the 548 Cucujoidea species recorded from Canada, 89 species in 48 genera and 12 families are reported as adventive, constituting 16.1% of the Canadian fauna of Cucujoidea. The majority of adventive species belong to the following families: Cryptophagidae (21 species), Latridiidae (20 species), Nitidulidae (13 species), Coccinellidae (11 species), Monotomidae (7 species), and Silvanidae (6 species). Most species originate from the western palaearctic. All adventive species are reviewed, and illustrated with color habitus photos. The male aedeagus for 15 difficult-to-distinguish species are illustrated with 30 line drawings. The Canadian distribution for each species is mapped and the general distribution in the USA is provided. Fifty-three new Canadian provincial and territorial records are provided. Two species, Acanthogethes fuscus (Olivier), Nitidulidae, and Stephostethus productus Rosenhauer, Latridiidae, are removed from the species list for Canada. General habitat information for each species is summarized.